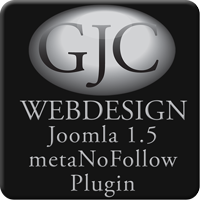 Joomla 1.5 nofollow Plugin updated to include selectable new window attribute, the target=_blank tag. We have updated our Joomla 1.5 nofollow Plugin to include the ability to select whether the outgoing link opens in a new window or not. This is set in the backend parameters. It is nice not only to have Google not follow your competitors links but also, if you must include the link, make it open in a new window. This way at least your site is still on the screen. Now you can just set this option in the backend of the Plugin parameters. You can download it here - Download - The price is €5.00.